The other night I thought it would be a good idea to live tweet a film. 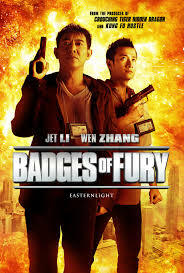 I thought it would be a good idea to live tweet Badges of Fury (2013), a Jet Li buddy cop comedy. That second part was not a good idea, because the film was woeful. Hopefully this review is mildly better. I did end up going off topic and rambling about Limoncello and pondering decent Jet Li films a fair bit. Limoncello is awesome. This film is not. All of a sudden free on a Sunday night. Might get my live tweet on. Will just raid the DVD cabinet, have a feed and be right with you. Well aside from the limoncello, that was irredeemably bad. Cheers Zoe. Glad you enjoyed this. Here is a wonderful little post Beer Movie has just put up. I am reblogging this in an effort to shed some more light on this painfully funny descent into filmgoing dissatisfaction and misery, because it fully deserves it. If my man has to suffer this apparently atrocious film titled “Badges of Fury,” then by George we all should suffer. Head on over there now and read along. It’s great stuff. Haha, thanks man. Appreciate your comment.